You know I love desserts, and in particular ice cream, so it should come as no surprise that I recently headed to DeLise Dessert Cafe to check out their offerings. Yes, they are called a dessert cafe, and specialize in making their own ice creams, frozen yogurts, and sorbets of interesting flavors (12 per day, all with organic Clover or Straus base). They also make a slew of mini desserts, perfect for being able to try many different things. This sounded right up my alley! I only tried the ice cream, but I'm intrigued by the creative other desserts, including tiny cupcakes with interesting fillings (like a green tea cupcake with azuki filling, sesame frosting, sesame seeds) and treats (like miso sesame rice crispy treats). They also apparently offer some sandwiches too, but who wants savory food when you can get sweets? The ice cream I tried was all fine, and the flavor selection was certainly interesting, but it wasn't particularly remarkable, particularly in the consistency. I expected something more from fresh made ice cream. Full notes of the flavors I tried are below. Triple Threat Ice Cream (Pumpkin, Pumpkin Ale, Pumpkin Seed Brittle): Decent pumpkin base ice cream, chunks of pumpkin seed brittle that tasted almost burnt. Ok creaminess. I liked the idea of the brittle in the ice cream. 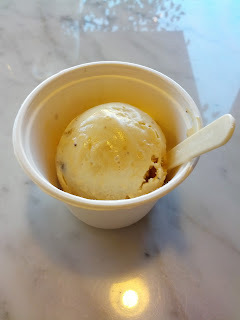 Coconut Pandan Sorbet: Nice coconut flavor, ok creaminess, particularly for a sorbet..
Salted Caramel Brownie Ice Cream: No salted flavor, not caramel flavor. Meh! $2.50 seemed pricy for such a tiny scoop. Split Bread is one of the eateries that debuted as part of the new Metreon buildout. It is an offshoot of the popular Mixt Greens mini-chain, but with a menu centered around sandwiches rather than salads. The focus is on local and fresh, with house roasted rotisserie meats, artisan bread, house made spreads and pickles. They are trying to fit into an interesting genre, I guess "fast casual" is the word for it these days, although they do provide real silverware and cloth napkins. And have an open kitchen with a rotisserie. But you order at a register. Well, actually not quite. The ordering system is the most unique aspect of the place. There are 3 ways to order: you can do it in advance online. Or you can scan the QR code on your table and order via your smartphone from your table. Of you can walk up to the front, where there are computers, and place your order with a person there. It is completely cashless, but they also do not accept anything like LevelUp or GoPago, which I found a bit odd, since it seems like they'd want to harness those users and payment system. The space is nice for a causal place, with beautiful wooden tables that seem a bit out of place. The servers bring your food to you once it is ready. If you ordere in person, they give you a number, which you place on the table, to identify where you are sitting. If you scanned the QR code, it identifies which table you ordered from, so they know where to bring the food. If you ordered online ... confusion happens. I'm not really sure how they intended to deal with that, but everyone who ordered that way had to be pretty proactive in getting their food delivered to them properly. 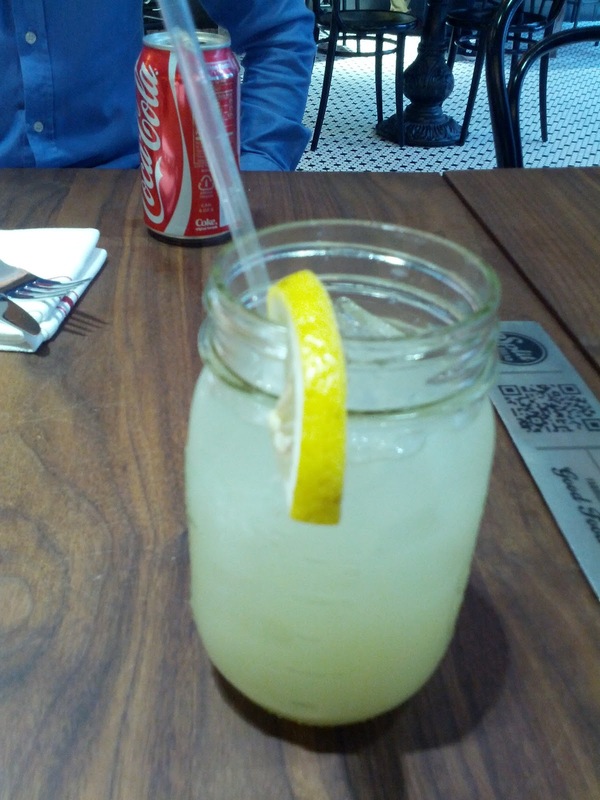 The lemonade was served in a cute mason jar. It did indeed seem fairly fresh, nice and tart. It was a little too sweet for me at first, and I considered getting some water to cut it, but as the ice melted, it quickly reached a better balance. Generous portion for $2. They also had jugs of water available to bring to your table, a nice touch. No. 36: Crispy eggplant, heirloom tomato compote, squash blossoms, mozzarella cheese on focaccia. $8.95. The sandwiches are all named by numbers, but they aren't contiguous and look random to me. I think I'm missing something. Anyway, a lot of the sandwiches sounded amazing. There was a kobe meatloaf one. Or a classic meatball sub. Or a slew of sandwiches made with assorted rotisserie meats. But there was one that the Yelpers all kept raving about: the crispy eggplant. 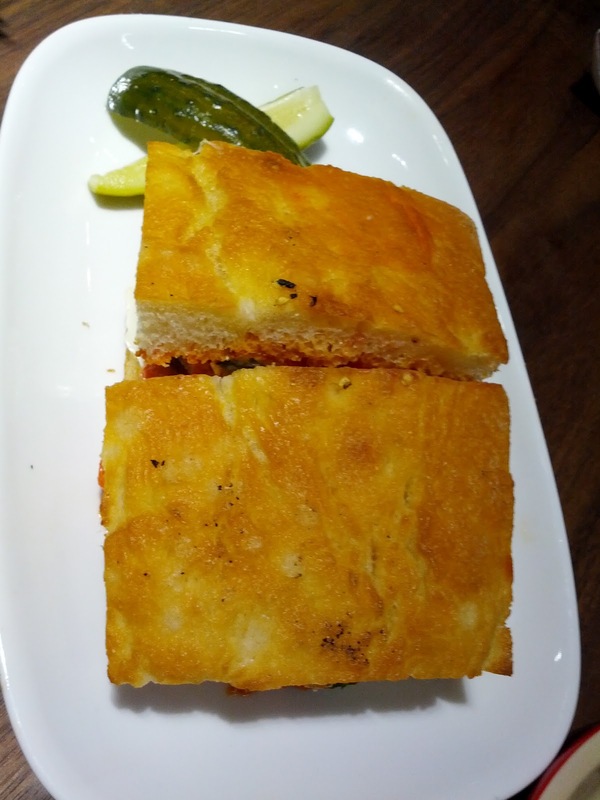 I should know better than to trust the Yelpers, but it sounded like eggplant parmesan, but sandwiched between two pieces of focaccia. It has been ages since I had eggplant parm, but back when I was a vegetarian, it was one of my favorite Italian foods. And who doesn't love focaccia? It sounded pretty great! Unfortunately, it sounded better than it was. It wasn't bad, but it just didn't really come together for me. I deconstructed it halfway through, and enjoyed it much more that way. Eggplant parm is good, focaccia is good, but as a sandwich, it all just tasted bland and the elements competed with each other, masking each other, allowing nothing to really shine. The focaccia was nicely toasted, oily, and decently flavored. I've had some really good focaccia lately, so it didn't live up to that, but it was good, and definitely good for a sandwich place. The eggplant was my biggest disappointment. Since it was described as crispy eggplant, I was expecting ... crispy eggplant. It was breaded, and clearly had been fried, but it wasn't crispy. At least it wasn't soggy or slimy like eggplant can get, but it wasn't remotely crispy. The heirloom tomato compote was a nice spread, basically a thicker tomato sauce. The mozzarella was another disappointment. It was served as very thick chunks, and wasn't melted. Perhaps this was intentional, but I had eggplant parm in my mind, with nicely melted cheese, and the solid mass of mozzarella really wasn't what I was wanting. Had it been sliced thin, I think it would have melted and worked much better. I never found any squash blossoms. Served on the side were two pickle spears. They were a really interesting flavor, not as sour as a dill, but not a sweet pickle either. Tart, pickled for sure, but I don't know how to classify them. They were crunchy. I liked them. Overall I was disappointed with my sandwich, and grumpy that I'd listened to the Yelpers. I had serious envy for the other sandwiches I saw around me, including an amazing looking one on a homemade english muffin bun dripping with some special sauce, and a fantastic looking bbq one. $8.95 was a fair price for a quality sandwich, but I wouldn't get this again. Brussels sprouts with brown butter. $4. All sides are a la carte and $4. I was feeling particularly fall inspired, so I went for the brussels sprouts. They arrived nice and hot, clearly freshly prepared. 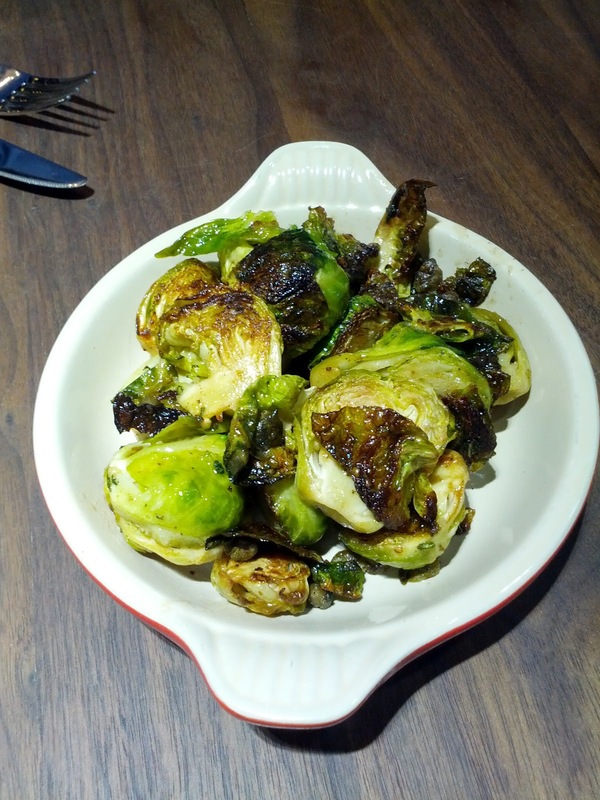 The sprouts were very well cooked, still a little crisp, nicely browned on the flat side. Several of the leaves that had fallen off were super crispy, like little chips. Those were my favorites. There were also some capers in the mix, adding an excellent saltiness. Overall, they were very well seasoned, with I think some lemon and additional salt. I didn't really get the nuttiness I expected from the brown butter, but I didn't care. These were quite tasty, and a good value at $4. My favorite dish of the evening. They seemed a little strange as a side with sandwiches and salads however, seeming more at place on a regular restaurant menu. 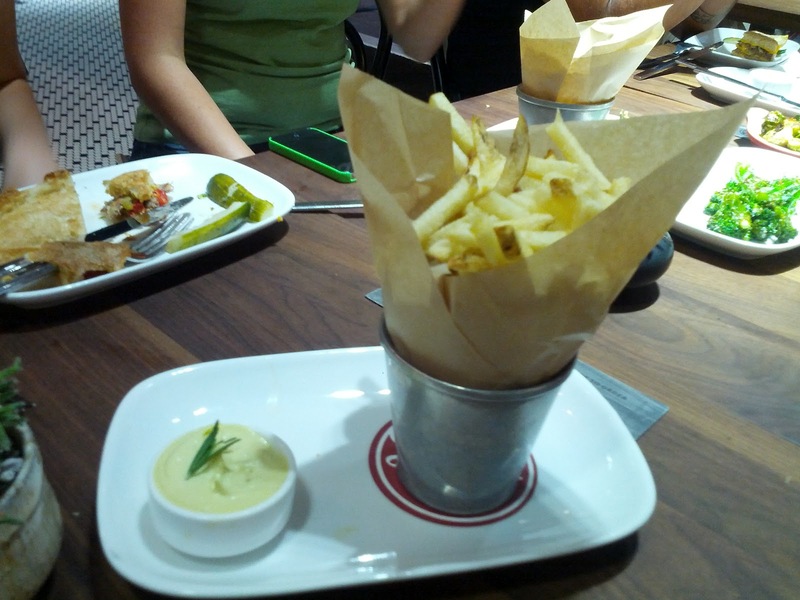 Hand cut French fries with parmesan aioli. $4. A more traditional side to have with a sandwich, the fries. The fries were thin style, nice and crispy. Not remarkable, but not bad. The aioli was very thick. I didn't taste any parmesan in it. But, there was a sprig of rosemary on top, and the rosemary flavor was incredibly strong and unique. I liked that element. These were good, but not really noteworthy. Perhaps I'd get them again if I was in the mood for fries. $4 was a fine price for the size of the order. I've had a thing for potato salad lately, so I was excited to see it listed as a side. 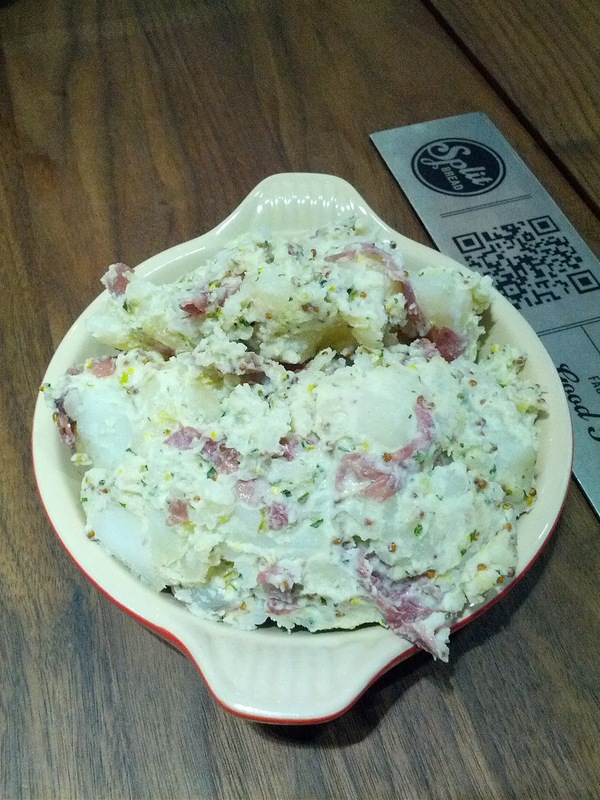 I've found some really great potato salad, like that from Fountain Grill. 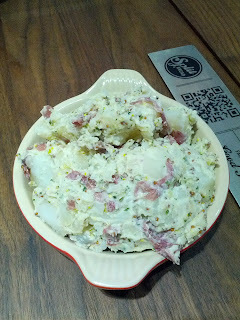 And some not so great potato salad, from A.G. Ferrari. This fell in the not so good category. The potatoes were red potatoes, skin on. They were cooked well enough, but served in very large chunks. Many of the chunks were so large I had to cut them, something I'm not used to with potato salad. The dressing was grainy mustard based, not much mayo, but also just not much flavor. There wasn't anything else in the mix. Least favorite dish of the day, by far. I wouldn't get again. Decent portion for $4, but the worst potato salad I've had in ages. Ok, yes, I'm reviewing another fast food chain, which I know continues to kill my foodie street cred, but like with Quiznos, at least I'm not reviewing their primary product, right? And, you can probably guess why. LevelUp, of course! Edwards Georgia Pecan Pie. $1.49. 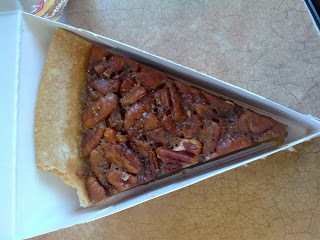 The menu listed pecan pie, one of my absolute favorite comfort foods. My mom always makes pecan pie when I visit, and I just love the stuff. She even just makes the classic Karo recipe, and uses Pillsbury pre-made pie crust. Nothing special, as generic as it gets, but I love it. Sweet, sticky, delicious! Particularly with some whipped cream or ice cream on the side. Yum! Anyway, I figured if my mom's generic pecan pie could make me so happy, perhaps Popeyes could as well. It turns out that their pecan pie is just Edwards brand, the single slice servings you can get at any low end grocery store in the freezer section. The container it came in gave it away, with the Edwards labeling and the "keep frozen" instructions. I looked it up when I got home, and found that Edwards has been around since 1950, and is "known for its wide variety of great-tasting, indulgent pies and desserts". Their description of the Georgia Pecan Pie is that it is a "sweet, crunchy pecan filling layered on top of a flaky pastry crust, giving you a rich homemade taste experience in every bite." My mom's actually comes across as homemade. This does not in any way. The crust was not remotely flaky. It also came as pictured, with a big chunk missing. Interesting. It was indistinguishable from cardboard. The pie was two layers, one of just the sweet filling, and then the top was pecans. The layers were not mixed at all. I prefer my pecans and corn syrup mixed! The sweet layer was just sweet, didn't have any depth of flavor to it at all, no slight caramel flavor that I like. The pecans were soggy. This was nasty. Do not get. I don't understand how Edwards can exist for 63 years making this! 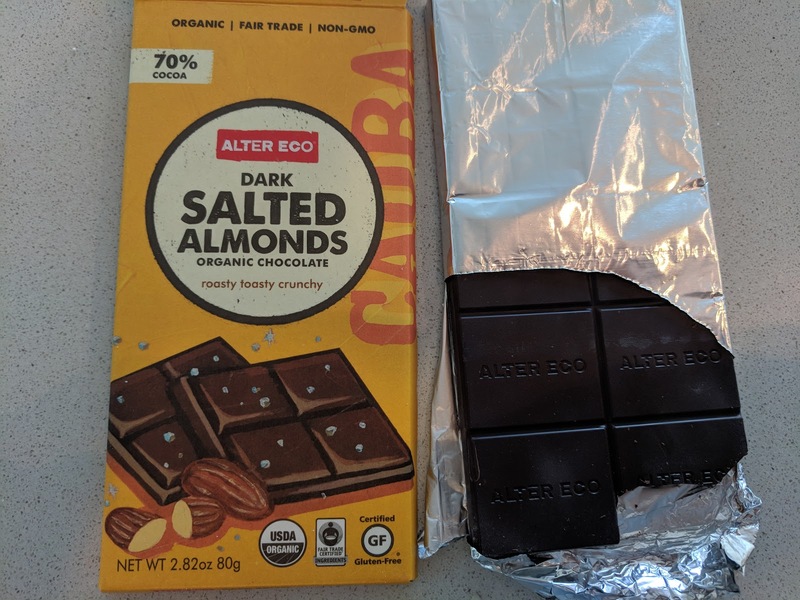 Alter Eco is a local SF based producer, with a seemingly random assortment of products including quinoa, rice, sugar, and chocolate. The basis for the company is sustainable products, all organic, fair trade, etc. I've tried their quinoa in the past, but didn't take any notes on it, and don't recall much about it. So today, I'm focusing on the one thing I do always take notes on: chocolate! Their chocolates are all single origin, and do not contain any soy. Most of the flavors have interesting textural additions, like ... quinoa. "Almond lovers, here's something to sink your teeth into. Roasty-toasty almonds swim in deep, dark Ecuadorian chocolate, with a sprinkling of coveted fleur de sel de Guérande to heighten each and every flavor. This is how a classic standby becomes a sophisticated addiction." The dark chocolate base to this was fine. I loved the pop from the salt. But ... the bits of ground almonds made the entire bar bitter, which ruined the eating experience for me. Did not like. Dark Blackout: 60%, single origin from Ecuador. Tasting notes: Really bitter, yet smooth at the same time. Dark Coconut Toffee: 14%, single origin from Peru. Tasting notes: The coconut flakes were nice, as was the crunch from the toffee bits. Dark Mint: 60% dark chocolate, single origin from Ecuador, with peppermint crystals. Tasting notes: gritty from the crystals, but nice mint flavor. Dark Noir: 60% dark chocolate, single origin from Ecuador. Tasting notes: Nice smooth chocolate, good mouthfeel. Lots of flavor in this, both fruity and spicy. None of us could really identify specific flavors, but there was a lot going on in this. Dark Quinoa: 60%, single origin from Ecuador. Tasting notes: You didn't taste quinoa exactly, just got a delightful crunch, sorta like from a crunch bar, but obviously with quinoa instead of rice. Kinda interesting. Dark chocolate was good.